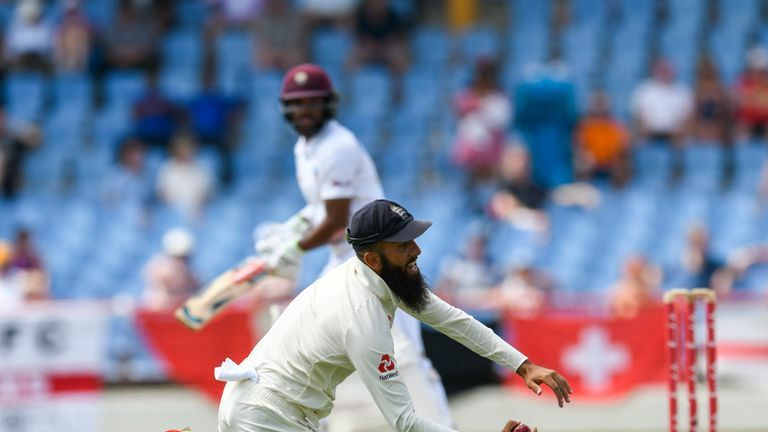 Moeen's stunning catch, Stokes' gymnastics display, and an England consolation win... all you need to know from day four of the third Test in St Lucia. James Anderson and Moeen Ali starred as England wrapped up a resounding 232-run victory over Windies in the third Test in St Lucia, writes Kalika Mehta. Although Ben Stokes' impromptu handstand caught the eye - particularly that of Sky Sports pundit Rob Key - the stand-out moment was Moeen Ali's blinding catch at the start of the Windies' second innings. Poised in the gully, Moeen hurled himself to his right to intercept the edge from John Campbell, taking the ball as clean as a whistle and setting the tone for the rest of the morning session. England have had difficulty in shifting the Windies' opening pair throughout this series, but Campbell's departure was quickly followed by those of Kraigg Brathwaite and Shai Hope as the tourists' path to victory became clearer. Credit must also go to the injured Keemo Paul, who came to the wicket at No 11 to help Roston Chase reach his century - and, despite being unable to run, clubbed Ben Stokes for three consecutive boundaries into the bargain. James Anderson has now featured in a record-equalling 67 Test victories for his country - the same number as recently-retired former England captain Sir Alastair Cook. England's victory in St Lucia ensured that they avoided a series whitewash against Windies for the first time since 1986, when David Gower's side were beaten 5-0. Moeen Ali moved into fourth place on the all-time Test wicket-taking list of England spinners when he dismissed Shane Dowrich in the afternoon session. The Worcestershire man overtook Tony Lock (174 wickets), but still has some way to go to challenge Derek Underwood's total of 297. Even at 36 years of age and fast approaching 150 Test appearances, James Anderson has shown he believes it's never too late to experiment and try to improve your performance. Anderson switched to a longer run-up at the start of the Windies' second innings and the change paid immediate dividends as he demolished the home side's top order to reduce them to 10-3 in next to no time. It goes without saying, but the Lancashire seamer's attention to detail and willingness to innovate is one of the many reasons why it will be a daunting task for England to replace Anderson when he finally calls it a day. Jimmy Anderson is on 🔥 today! Joe Root: "It was really important we performed well this week. It's been a tough tour, Windies have played some fantastic cricket and deserved to win the series - they outplayed us in the first two games. "But to win in the manner we have this week is really pleasing and it's a real step forward. We've got a fantastic squad of players with a huge amount of ability and I'm sure over the next couple of years you'll see a huge improvement from this team. "This should be a real confidence booster going into a very exciting summer of cricket for us." Michael Atherton: "Changing his run-up and implementing it mid-Test match says something about James Anderson. "This is a guy who has played 147 Test matches, has more Test wickets than any other fast bowler in the history of the game but he is still open to improvement and looking to learn and change or adapt. "In the Caribbean you have to hit the pitch hard, you cannot float it up on an English length. What Anderson is probably feeling is that he has got to give himself more 'oomph' into the crease. "He has run in with a bit more vigour and intent and obviously the rewards came." Mark Butcher: "His (Buttler's) record has not been good recently. You can be going absolutely fine and catching absolutely everything and not giving it any thought. 'My moment of the series!' 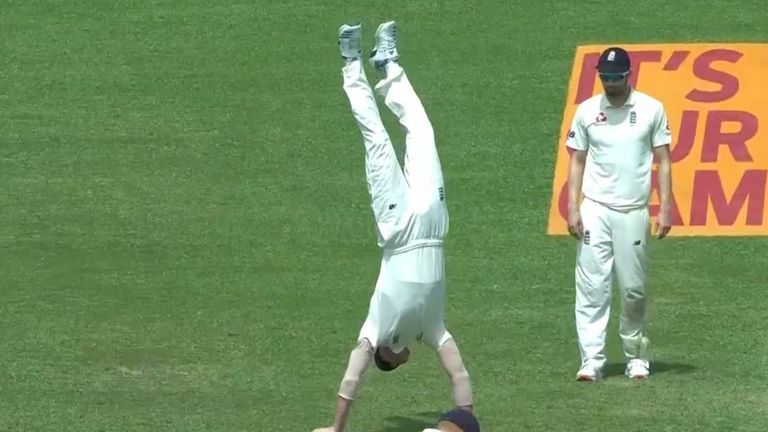 Sky Cricket's Rob Key was bowled over by Ben Stokes' handstand on day four in St Lucia! "You're standing there nice and relaxed and the minute you drop one, you think 'well how has that popped out?' All of a sudden you are thinking about it. You are watching the ball as hard as you would, watching the edge but there is a tension that wasn't there before. "You don't want to let any of the other guys down, which is the worst part of dropping a catch - the idea of letting down your bowler and team. If that starts to creep into your body and you feel that tension, what was soft and easy before is now rigid and out the ball pops."